Relocation can be is just as stressful as it is exciting. Moving out of state is like starting a new chapter in your life. New city, new house, a new place of work. But the process of moving can be really nerve-wracking. You have to transfer all your accounts and move all your things to a new place. One of those things is your car. To transport it, you can use the help of car movers. 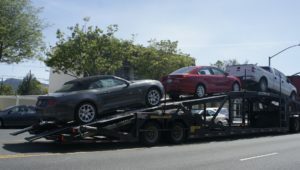 Many people use car shipping services when they relocate or buy cars from out of state. It is convenient and time-saving, and also usually cheaper than any other options. Our Colorado Springs Car Movers will be happy to help you with your relocation. We can ship any kind of car or another vehicle in any condition. Colorado Springs Car Transport ships all around the country and delivers door to door. While you are busy dealing with other problems of moving, our reliable team will take care of your vehicle. We will pick it up from the desired location and ship it right to your place, safely and promptly. In a hurry? Colorado Springs Car Transport can help! We offer Expedited Car Shipping services for those who don’t have time to wait for a week or two to get their car picked up. Our team will always do their best to arrange and schedule shipping the client will be happy with. Ship your car in an open or enclosed trailer and get the updates on the status of delivery over the phone. Vehicle Shipping with Colorado Springs Car Transport means everything goes smoothly. Get a free quote from us today! Call us or request it online by filling out a simple contact form on our website. We are looking forward to shipping for you!